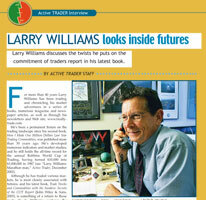 Larry Williams has been entrenched in the markets for more than 50 years. Just to give you an idea of how innovative and productive Larry has been, we thought we would list some of the trading tools he personally has developed and his comments. Larry's work has always been in demand throughout the world, which is why his books have been published in nine different languages. Here are some of his innovations, described in his own words. WILLIAMS %R - 1966. Inspired by Allan C Davis. This may well be the most widely followed index in the marketplace, as it is shown every day in China on every stock in their markets. A great tool with many uses. PROJECTED HIGHS AND LOWS, A.K.A. PIVOT POINTS - 1966. These are wildly popular nowadays. I first wrote about them in my 1966 book on the stock market. I know they're good, I learned them from Owen Taylor's work in the 1930s... but they are not the "be all end all" that people who sell this formula claim. Be careful if you use them. WILLIAMS ACCUMULATION/DISTRIBUTION - 1967. I think the first book I ever read about the stock market was Joe Granville's, and I was taken by his on balance volume idea. There are things I liked about it a great deal and eventually I found the two gentlemen from San Francisco Woods and Vignolia who were apparently the originators of the concept. But there were problems with OBV. Dave Bostian had his intra-day intensity index, which triggered an idea in my mind to reference the opening price to measure accumulation and distribution. We hand punched computer cards, loaded them into the computer and came up with a new way of measuring accumulation distribution that I still use to this very day. This was a major breakthrough. SHADOW TECHNIQUE FOR MOVING AVERAGES - 1969. Later on, this became known as projected moving averages. It is just one more way of smoothing out the trend of a moving average and knowing when a real trend change has taken place. Prior to my work though, no one was leading or lagging moving averages. MOMENTUM STUDIES OF ACCUMULATION - 1970. Once we had a new way of looking at accumulation distribution (Williams Accumulation/Distribution), Jim Waters, one of my stockbrokers, and I began measuring the momentum of the accumulation. We first wrote about this in Commodities Magazine in 1970. It has since been written about by many people, but again, our work was the first. WILLGO - 1970. This indicator was first discussed in my 1970 book. It is a measure of municipal bond prices to forecast stock market turns. While not always perfect, it has held up over the years in giving a reliable forecast of were stock prices are going. FOUR YEAR MASTER STOCK MARKET PATTERN - 1970. I made my first million dollars trading stocks in 1970. However, I did not cover my short sales soon enough and gave back a good deal of profits on the rally off the low. Late one night, licking my wounds and looking at my charts, I noticed a particular pattern, revolving around the last four years. Nothing has done a better job of calling future market turns than this pattern I discovered... that's right, nothing. FIRST BOOK EVER ON SEASONALITY OF COMMODITY PRICES - 1973. As far back as the 1800's people had written about the seasonal aspects of commodity trading. Yet, no one had ever performed the research and statistical analysis to prove mathematically that they did indeed exist. I did that and further created an index for each and every commodity. My book, kicked off an entire industry of seasonal and advisory services, funds, chart services... you name it. That little book was a springboard for many, many careers. Today, seasonality is not the novel idea that in 1973. It was as startling and as crisp as a magician's trick that you've never seen before. WILLSTOP - 1978. Best Trailing Stop Ever. This one is a dandy. Totally unique. There's nothing else like it. Once in a position, you need to have a close trailing stop. This is an interesting trailing stop because it's based on market action, not a moving average. It keys off specific price points and patterns in the market telling, us when and where to raise our stops. TRIANGULATION, PROPULSION, AND SEQUENTIAL - 1978. Tom DeMark and I created these three very interesting trading patterns. Sequential is the most widely known, and Tom has written a great deal about it. It's available every day on Bloomberg and is followed by traders throughout the world. NUMEROUS TRADING PATTERNS- 1981. OOPS! Fakeout, Delayed and Hidden OOPS!, Pinch and Paunch, etc. VOLATILITY BREAKOUT - 1982. Yup - that's my baby. Probably one of the most popular forms of trading right now but "old hat" to me. This was a terribly novel concept in 1982; to buy some expansion of the current range or the last few day's average of the range added to the opening or close, or some other value. I made over $1 million once I discovered this, as did numerous of my students. It has not worked as well in recent years... I should never have let the cat out of the bag! MONEY-MANAGEMENT BREAKTHROUGH. No one in the 1960s 70s or 80s was using any form of consistent money-management. My trading championship shattered all the records. It was largely due to the money-management scheme I used... Money management became in vogue. I can't take credit for the following individuals' work, but I think I was the genesis for what Ralph Vince, Ryan Jones and others have produced. I have since devised my own money-management formula, which is unique in that it is tailored to you not to me... the only money-management formula of its kind. WILLVAL - 1990. Another revolutionary indicator to tell when a commodity is over/under valued. We can tell when a stock is undervalued based on price-to-book ratios, price earning ratios, etc., but how do we tell about a commodity is undervalued We didn't know how, so I developed valuation models that have great track records for individual commodity markets. PRO-GO - 1997. A unique way to tell what the public and professionals are doing. This is one of my pride and joy's. I was able to determine what buying is done by the public and what buying is done by the professionals every day. When there is more public buying than professional buying, markets decline. When there's more professional buying than public buying, markets rally. WILLTREND - 1999. Trend following index. It's the path to major riches, but it's an extremely tough path to follow. Most people use moving averages to follow trends. That approach can be good, but a better idea was arrived at by Welles Wilder and Gresham Northcott by using a volatility index. I just added a twist to their work that makes it a little better. DARLINGS OF THE DOW - 1999. Perhaps the safest stock investing system ever, based exclusively on fundamentals. LW SENTIMENT - 1999. I went public with this indicator for the first time in the Bloomberg Book called Trading Secrets of the Masters. This indicator is my representation of advisory bullishness, based on our weekly polls of brokers, advisors, and newsletters. FIRST SENTIMENT INDEX ON INDIVIDUAL STOCKS - 2000. Sentiment indicators have been around for a long time. But no one has ever done weekly sentiment indicators on individual stocks. I do it, and even to this day no one else does it. This is an invaluable tool. The original idea of measuring investor sentiment was that of Garfield Drew. Garfield looked at odd-lot short sales as a market timing indicator. BLASTOFF! - 2002. A cool little indicator that tells us what a market is ready to blast off, up or down. It allows us to pinpoint specific days when the market will have an explosion of energy. COT INDICES, INCLUDING PROXY FOR STOCKS - 2004. What do we do for markets that don't have a cot report I created a synthetic cot index for individual stocks as well as future markets that do not have a cot report. FIRST BOOK EVER ON THE COMMERCIALS REPORT (COT REPORT) - 2005. Again, the first book ever on the subject matter. I have been using the cot report since 1969. I don't know of anyone else that has used it longer. My mentor Bill Meehan, taught me a great deal about the report, and I've learned more about it on my own since then. If you did not know about this report, you should not be trading commodities. RANGE RIDER - 2006. A new band new indicator, a way to gage the volatility in any market. PUBLICLY CALLED THE 1982 AND 2002 MARKET LOWS ONE YEAR IN ADVANCE. These were the best buying points of the last 30 years. These were also announced in my books published well in advance of the actual low. How's that for a market call! WHAT ELSE Friends and enemies, as you can well imagine. I've met some great people over the last 45 years, developed some wonderful friendships and have rubbed some people wrong way, creating a few enemies! That's the way it is when you're on the leading edge. I hold nothing against the people who take pot shots at me. At 64 years of age, I can understand it... especially from the young guns slingers!